In macOS, you can cycle through applications (note: not windows) by pressing ALT+TAB. However, when ALT+TABbing in Plasma 5, you cycle through all windows of all applications, which can get overwhelming when having multiple instances of one app. I would like to be able to alt-tab between apps just like in macOS (switching between windows of the same app is already solved by ALT+`). Not the answer you're looking for? 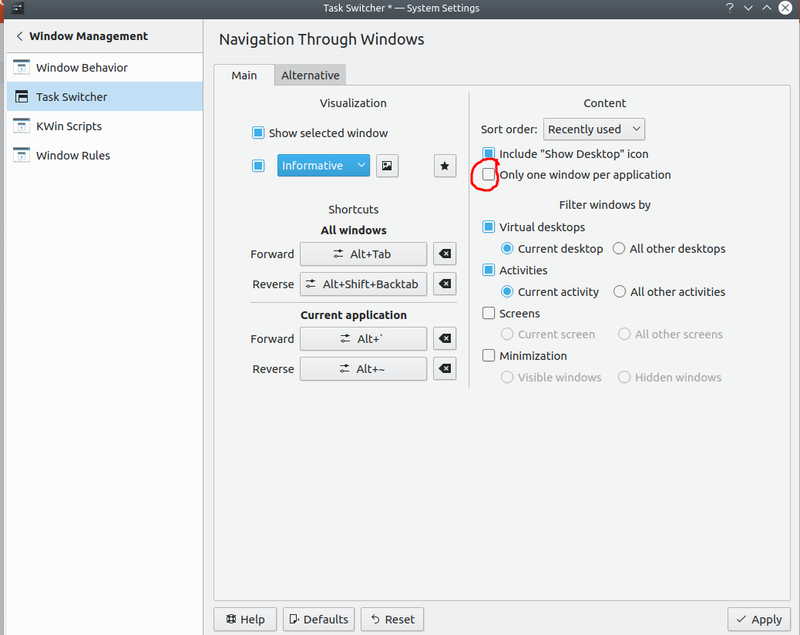 Browse other questions tagged kde window plasma application-switcher plasma-5 . How do I revert the alt-tab behavior so that switching to an app brings to the front all the windows of that app? How can I prevent the alt-tab shortcut from nesting terminal windows? Alt + Tab to show all instances of an application?